Written on February 4, 2019 . Posted in Blog. As a homeowner, you probably have many questions about your HVAC system. 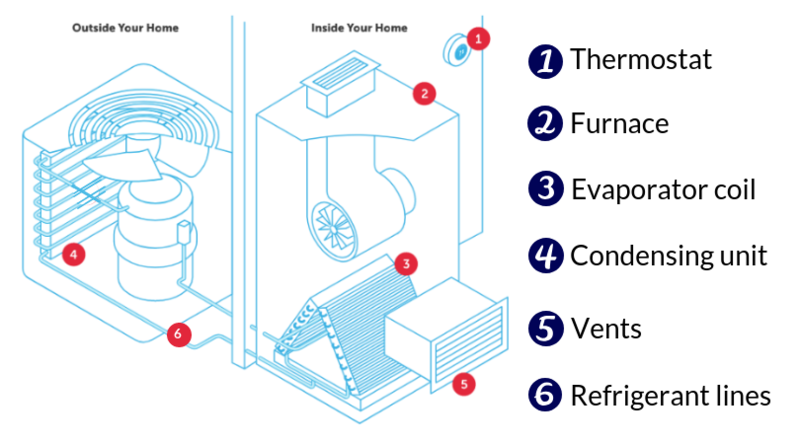 Now you may have never thought about becoming an HVAC expert in your free time, but with our help, you can at least be familiar with the most basic components and what they do. Mounted on a prominent, easily accessible wall, the thermostat is the most visible and interactive part of your HVAC system. Either programmed in advance or set manually, your thermostat directs your system to keep your home at the desired temperature. When the temperature in your house gets too hot or cold, the thermostat will trigger your HVAC system to start circulating air as needed. Your furnace or air handler is the other inside portion of your HVAC system. Typically these are located in your garage, basement, attic, or a special closet designated for this purpose. The furnace or air handler is designed to heat or cool air which is then distributed to different parts of the home via ductwork. Fossil fuel burning furnaces and electric air handlers are utilized for this purpose, depending on the type of system in your home. 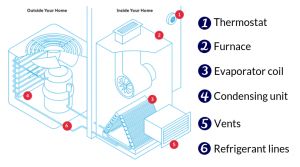 The evaporator coil is used in conjunction with your furnace. It is located within a separate metal enclosure installed adjacent to the furnace itself. To simplify a much more complicated process, refrigerant is pumped into the evaporator coil and, like a cold glass of water on a warm day, the coil pulls the heat from the air as it passes over the coil and cools it at the same time. The cool air is then circulated through the ductwork. Ductwork refers to the system of ducts, which you might compare to pipes or channels, that transport air – warmed or cooled by the system – to various parts of your home. They are most often made of lightweight aluminum but are also manufactured from steel, flexible plastic, polyurethane, or fiberglass. These are the outlets that help deliver the heated and cooled air from the duct system into the individual rooms of your home. Made of high-and low-temperature safe metal or similar materials, the vents are located on the ceiling, upper parts of walls, or in the floor. Each vent is fronted with angular slats that direct the in a particular direction. In certain applications, they can be controlled or even closed manually to control the amount of heated or cooled air that’s being sent into the room. Otherwise, care should be taken to not block or impede the airflow from vents as this will affect the overall comfort of your home. Connected to the inside evaporator coil by special refrigerant lines, the condensing unit is installed on the outside of your home. This unit contains the compressor – which can be likened to the heart of your heating and cooling system. When refrigerant is cooled by the cold air passing over it, the condensing unit pumps that liquid to the evaporator coil to be evaporated into gas once more. It is a continuous cycle during the operation of the system – with the refrigerant gas being continually compressed and cooled for conversion back to a liquid again. These narrow metal tubes carry the refrigerant in gas form to the condensing unit and then back to the evaporator coil in liquid form. These tubes, made of a durable heat- and cold-resistant metal such as copper or aluminum, bridge the gap between your home’s indoor and outdoor units. If you have additional questions regarding your HVAC system and what each part does, or if you realize that system may be overdue for some maintenance, give us a call: (757) 418-8305.